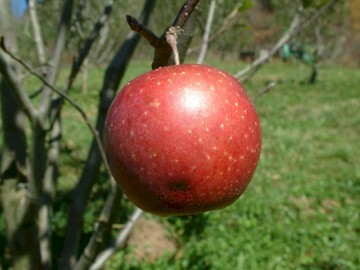 An excellent old southern apple noted for its long-keeping abilities. It originated before the Civil War with a Mr. Terry of Fulton County, Georgia, and was soon widely sold throughout Georgia and neighboring states. Medium-sized fruit with thick, tough yellow skin covered with stripes and splashes of red and crimson. The white flesh is crisp and juicy. Ripens November and is an excellent keeper. Looking for 2/3 Terry Winter apple trees.